Hotel St George offers att the facilities you would expect from a 4star hotel. A full range of guest rooms are available to suit all types of guests. For meals it's casual dress during the day and smart/casual at night for drinks, snacks or meals, the hotel offers a wide choice of restaurants and bars. 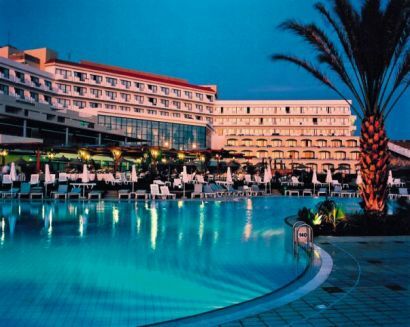 The Hotel St George is perfect for a great holiday in Paphos, either with the family or just your partner. The Hotel St George is only 5 minutes from the harbour and 20 minutes drive from Paphos airport. "Hotel St George - Not At All Bad"
Just got back from 10 days hol. didn't know we were going to this hotel and was pleasantly surprised. The plus points were that the main areas seemed spotlessly clean, both restaurants were efficient with good food. The minus points were that although our room was described as 'side sea view' we in fact overlooked the back of the kitchens but if we leaned out a bit, we could see the sea; the 'entertainment' was dire - the only good bit was the chap that was one half of the Blues Brothers and he also did a passable Elvis; we had to wait to be served drinks in both main bars (you were not encouraged to approach the bar); the pool was absolutely freezing; the location of the hotel was such that it seemed miles from anywhere, although the bus service from the main road seemed quite good. We realised that it was more or less out of season, but was surprised at the amount of premises (hotels, apartments, shops) that were closed which gave it a bit of a desolate air. Probably shan't go back to this particular hotel, but on the whole it wasn't bad. Just pleased we seemed to have a got a bargain!! "I Would Recommend The St George Hotel"
I would recommend the St. George Hotel to anyone who enjoys luxury at affordable prices. The St George Hotel only has a 4* official rating, in my opinion it should higher. I have stayed in 3* hotels before this holiday and so was overwhelmed by the quality of this hotel. The Entrance and main hall is perfectly decorated with the rear wall of the building made of only glass, so you see a perfect view of the sunset over the med. The food and restaurant service is impeccable, cannot fault it. The pool is clean and at the perfect temperature to swim in. There are lawned areas next to the beach where most people sunbathe. We prefered the beach as the heat more bearable with sea breeze. "Is This Really A Thomson Platinum Hotel?" Is this really a Thomson Platinum hotel? After having been on several Thomson Gold holidays and thoroughly enjoying them we were really looking forward to this Thomson Platinum hotel. How can Thomson have graded this hotel Platinum? It was worse than any of the Gold hotels we have stayed in and has led us to question Thomson's grading. The hotel itself was clean and the hotel and bar staff was very friendly. The rooms looked as though they had recently been refurbished, but they had forgotten about the bathrooms as they desperately needed a re-fit - having chipped tiles and mouldy surfaces. We expected the hotel would be busy at it was peak season, but you had no chance of getting a bed around the pool unless you got up at 6am and beat everybody else in the race to put towels out! Despite all notices not to reserve beds, of course it was happening and nobody was stopping this. The beach area had recently been modernized and was very nice with a little bar and a pool bar. As this is where we ended up most days because we couldn't get around the pool area, we found this really quite a nice area of the hotel. The evening entertainment became a bit of a joke; we were at the point of cringing at some of the acts! We were looking for somewhere to hold our wedding the following year, and decided that this definitely isn't the place for a wedding and we wouldn't go back. "St. George Is Not Very Well Positioned"
Never having been on a package holiday before we didn't know what to expect (we usually visit family in the Southern Hemisphere) and therefore we have nothing to compare it to. We must say that the hotel was lovely, the bedrooms had air conditioners (it was still very hot in October, with a slight hot wind), and were well kitted out and cleaned everyday. The food was very good and the staff throughout the hotel were friendly and very helpful. There was absolutely nothing to moan about. The St. George is not very well positioned if you are looking for clubs etc, it is not within walking distance of the harbour or Coral Bay. There were a few restaurants within walking distance, but the bus is only .50cents if you do want to go further afield. We never felt the need to leave the hotel at night there is a lovely bar with entertainment each night (not for those who like clubbing). All in all it was a lovely holiday and we will be going back next year, to the St. George - this time for 2 weeks instead of 1.